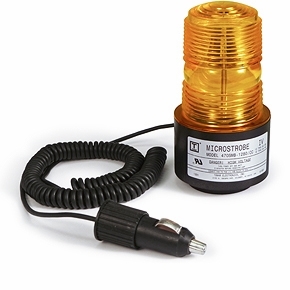 The MICRO IV strobe family is an enhanced version of the MICROSTROBE featuring a power supply which operates over a wide input voltage range of 12ï¿½80VDC or 16ï¿½24VAC. The supply has a regulated output so that the lamp brightness and flash remain constant when operated over the rated input voltage range. The power supply is potted in polyurethane for the ultimate in protection from moisture, vibration and exposure to high voltage. The enclosure is all Lexanï¿½, and the plug-in lamp is field replaceable. All units are polarity protected and have built-in filters to protect against radio interference and spike voltages. The MICRO IV is covered by a 10 year warranty. The MICRO IV and its guard are UL component recognized for type E, EE, and ES electric industrial trucks covered by UL standard #583.